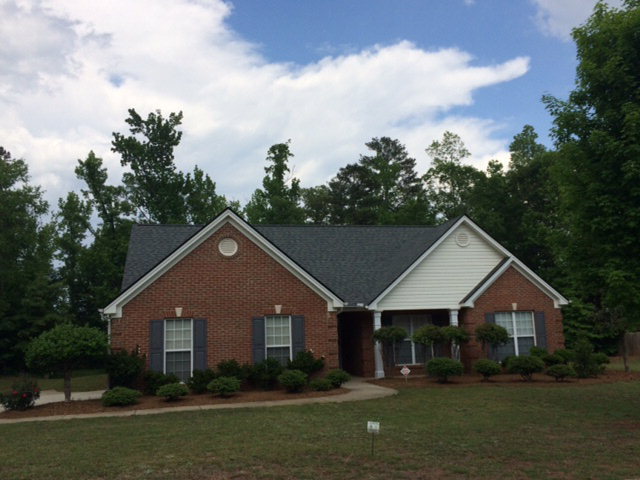 This 4 sided brick ranch features low maintenance vinyl trim and vinyl windows. A NEW ROOF WAS JUST INSTALLED AFTER HAIL DAMAGE. The sellers also installed beautiful hardwood flooring through the main living areas and the bedrooms. (There is extra flooring available if buyer wants to match the small foyer area.) This is an ideal retirement home! No stairs or steps! It has a covered front porch, which opens to the great room with vaulted ceiling and brick fireplace. There are arched openings to the huge sunroom which opens to the patio. Upon entering the breakfast area from the garage, there is a laundry room on the right, washer & dryer are negotiable. The kitchen features white cabinetry, a recent smooth top stove, microwave, dishwasher and side-by-side refrigerator. Beyond the kitchen is a formal dining room. The bedrooms are situated to the right of the foyer and there is a hall bath. On the back is an oversized master bedroom with trey ceiling and sitting/computer area. The master bath has a 42 shower and garden tub, double vanities and a walk-in closet. The front bedrooms have good closet space. This part of Athens enjoys sidewalks to schools and shopping which are just minutes away. The nearby Southeast Clarke Park features 'The World of Wonder' playground, and a whole lot more! All the homes in the neighborhood are brick. Old Lexington Trace is a subdivision within the city of Athens, Georgia. There are currently 0 Homes for Sale within Old Lexington Trace, with asking prices ranging from $0 to $0. The average list price per square foot of the available inventory in Old Lexington Trace is $0, which is the Athens average of $227. The Average Sales price of all sold real estate in this subdivision for the past year is $230,333. Recent comparable homes have been selling for 97.62% of their asking price. Waterfront homes represent of the available Old Lexington Trace inventory. The population of Athens, according to the 2010 Census, is 115,452. The total number of households in the zip code of Old Lexington Trace is 15,949, with an average household size for of 2.27 people. The total number of renter households within the zip code of 30605 is 10,099, which means that 36.68% of households in this zipcode are owner occupant households. 213 Ridge Run Crossing, Athens GA 30605 is a Home, with 3 bedrooms which is recently sold, it has 2,093 sqft, .51-1 sized lot, and Attached,Garage parking. A comparable Other, has bedrooms and 0 baths, it was built in and is located at and for sale by its owner at $ 0. This home is located in the city of , in zip code , this County Other, it is in the Subdivision, and Appleby Mews are nearby neighborhoods.